Scrambled eggs can cause various digestive complications if you have an allergy or intolerance with eggs. Scrambled eggs are typically made with other ingredients, such as milk, cheese and butter, which could be the source of your symptoms. Write down all the symptoms that develop after you ingest scrambled eggs and discuss them with your doctor. Avoid eating scrambled eggs until you are able to receive a clinical diagnosis. If you are allergic to eggs or an ingredient in scrambled eggs, you may develop more symptoms along with gastric complications. Eggs are a common food allergen that mainly affects children, but can affect anyone at any age. Most symptoms of an egg allergy occur within a few minutes or up to an hour after you ingest eggs. Symptoms may range from mild to severe causing skin irritation, asthma, nasal congestion and digestive difficulty, according to MayoClinic.com. An egg allergy is a hypersensitivity of the immune system to the proteins found in the egg white, egg yolk or both. The reaction of your immune system causes inflammation, irritation and swelling in your digestive tract, leading to nausea, vomiting, diarrhea and bloating. 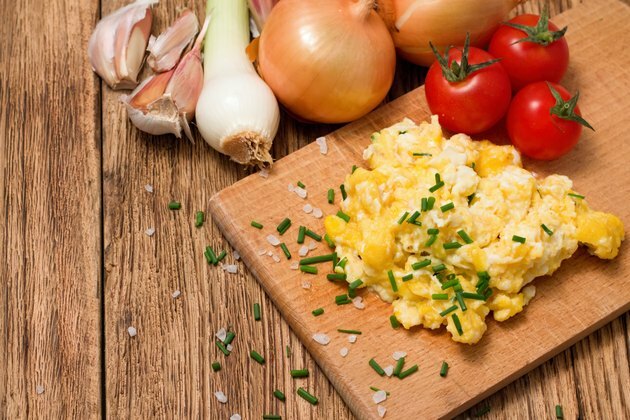 Eating scrambled eggs may also trigger an intolerance if your digestive system has a difficult time processing a certain aspect of the egg. According to a 2009 CBS News report, you can have an intolerance to any food, causing stomach pain, cramping, diarrhea, nausea and gas. Egg intolerance does not affect your immune system and will most likely not affect other parts of your body aside from your gastrointestinal system. Keep a food journal to help identify which foods cause similar symptoms. Discuss your food journal with your doctor. Scrambled eggs may contain other highly-allergic foods, such as diary products, tomatoes and cheese. If you are eating out, alert your server about your food allergies before ordering to ensure the scrambled eggs are free of any allergens. Cheese contains small amounts of mold spores, which can trigger an allergic reaction if you've been diagnosed with a mold allergy. If you're allergic to soy or wheat proteins, you may experience an allergic reaction from cross-contamination. For example, if wheat bread was used on a surface that was also used to prepare your eggs, the wheat proteins may contaminate the scrambled eggs. Because most scrambled eggs contain dairy products, your digestive complications may be related to lactose intolerance. Lactose intolerance affects about 50 million Americans, according to CBS News. This digestive condition is the inability to digest the sugar found in milk. The most common symptoms of lactose intolerance include bloating, gas and diarrhea.